When we first founded Bittermens in 2007, our vision was to make a range of cocktail bitters and other products to help bartenders create the next generation of modern classic cocktails. Our guiding rule for Bittermens is that we need to create products that are useful, focusing on new flavor profiles and only tackling the classics only when we feel that there’s no good solution available. In 2014, one of our distributors came to us with what should have been a very simple question: what would you recommend for a brand of affordable, all natural classic cocktail syrups? They weren’t asking for proprietary flavors, but for classic flavors like grenadine and lime cordial. It turns out that the distributor wasn’t getting requests for these products from the top end bars in their territory. Instead, it was restaurants and neighborhood bars: folks that had been using grenadine and lime cordial made with artificial flavors, colors and preservatives. They needed something with these familiar flavors, at an affordable price, that would allow these bars to elevate their offerings without having to significantly change their recipes or reduce their margins. We wracked our brains but just couldn’t find a brand that fit all of the qualifications: affordable, all natural and most important – that tasted right. Now, we aren’t syrup producers. Of course we know how to make a great syrup, but we don’t have the equipment to pasteurize, hot fill and properly produce the base juices we would need. So, instead of trying to reinvent the wheel, we decided to figure out how to build a better syrup using experts at every level. For example, to make our Tepache liqueur, we had to find a partner that specialized in making custom all natural fruit juice concentrates. Based in the Pacific Northwest, they built a custom pineapple concentrate for our liqueur. For the syrups, they supplied us with a variety of all natural fruit juice concentrates with guaranteed filtration, sugar and acid levels that we used to build the base of the syrups. With them, we could start with batches as small as a drum and grow to volumes as large as a tanker truck. Then, we looked for an independent bottler we could work with that could blend the juices, sugar, water, acids and other ingredients, pasteurize the mix and then hot-fill the product into the right bottles. After months of searching, we found a small organic certified co-packer in the New York Metro Area. From there, Speed Craft was born. Do we expect that every craft cocktail bar is going to pick up a bottle? Of course not. Just like restaurants that have aspirations to make their own condiments from scratch, many craft cocktail bars make their own classic syrups from scratch daily or weekly. But for the neighborhood bar that doesn’t have a kitchen and wants to make a better gimlet, or the taqueria who doesn’t have time to make their own grenadine for a Tequila Sunrise, or even the small chain who wants to make sure that every one of their signature cocktails tastes the same across all of their locations, we’re offering them a natural, consistent and affordable product. 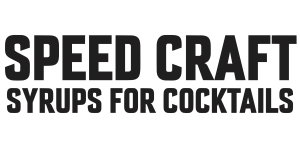 Speed Craft: making all natural cocktails more accessible.